This lesson can be used as a pre-lesson for the The Not-So-Great Depression: Bud, Not BuddyLesson plan. Write this student-facing language objective on the board: "I can cite evidence in a text with quotation marks using sentence frames." Students will be able to summarize text and cite quotes as evidence. Students will be able to cite evidence with quotation marks using sentence frames. Read the student-friendly language objective aloud and perform a choral reread with your students. Show students a T-chart poster labeled "Student" on the left and a Dorothea Lange image from the Great Depression posted on the right. Allow students as a group to write words, phrases, or sentences telling what they think is going on in the photo. Instruct students to write their name in the left column, and their comment in the right column. For a larger class, create more than one identical poster and split students into groups. Allow one minute for groups to silently observe other group sorts for comparisons. 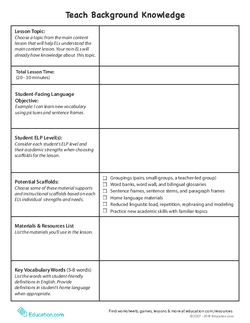 Meet as a whole class and show the teacher's copy of the Vocabulary Cards worksheet with the meanings attached. Have advanced ELs read the definitions of the words. Distribute the cut-off meanings of the Vocabulary Cards to each group and ask them to match the terms to the definition. 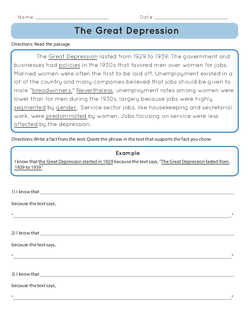 Hand out and read aloud the worksheet The Great Depression to your students. Then, reread the worksheet chorally with your class. Separate your students into partners to choral read the Great Depression worksheet and underline the vocabulary words they find in the text. Allow them to refer to their Vocabulary Cards or Glossary as necessary. Explain to students they'll use this text to practise citing information using quotation marks from a text. Write the following sentence on the board: "Quotes show what has been said by a person or in a text." Choose a student to point to the quotation marks as the class chorally rereads the sentence. "because the text says, ____." Tell your class they will talk about facts from the text and quote the text to support their answers. Then, they'll write their facts on the columned chart on the board using the sentence frames. Model how to complete the sentence frames in the two-column chart. Reread the first sentence from the worksheet The Great Depression and fill in the two-column chart (e.g., "I know that the Great Depression started in 1929 because the text says, 'The Great Depression lasted from 1929 to 1939.'"). Emphasize that you used the quotation marks around the words you copied straight from the text and that you had a comma after the word "says." Complete one or two more examples with the whole group. Then, ask partners to say one to two more examples using a quote of their choice. 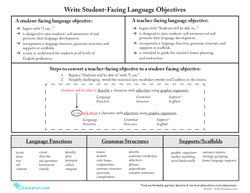 Post the language objective draw a rubric with two categories written underneath: "States a Fact," and "States a Quote." Place checkmarks below the two categories as you listen to students speak while they're in pairs or groups. This can be a helpful motivator for students as they see you quietly posting your observations. Limit the vocabulary sort to two categories: "We Know" and "We Don't Know." 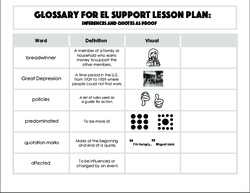 Leave vocabulary terms and definitions attached throughout the lesson (i.e., do not cut them out separately) but still have ELs participate in matching the meanings onto their intact copies. Pair beginning ELs with sympathetic advanced ELs in the discourse and sentence levels. Provide access to a dictionary, glossary, or additional vocabulary cards for the difficult words from the text. Have ELs summarize the text after the third read to monitor their comprehension. 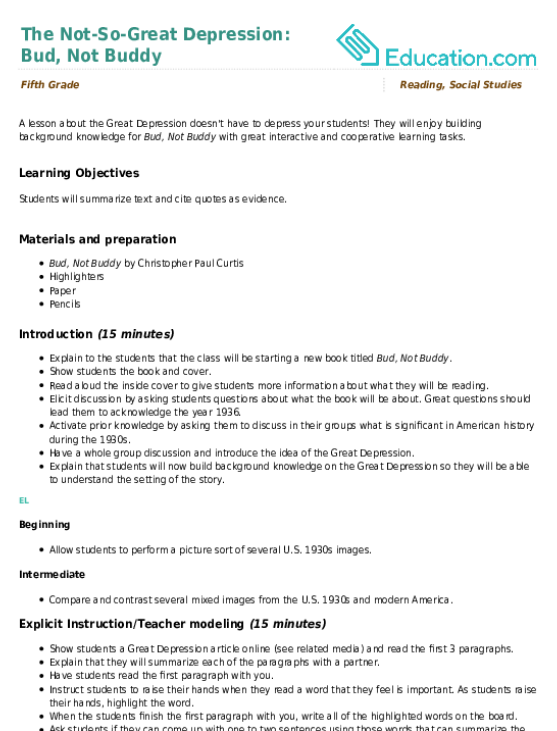 Remove sentence stems for the sentence level activity. 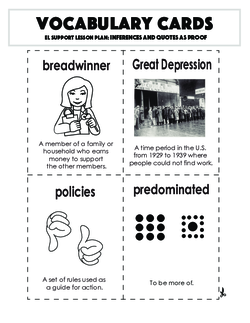 Have students complete all sentence frames for The Great Depression worksheet. Allow them to share their answers with the class first and explain their processes to struggling students. Listen to students as they share their sentences during the sentence and discourse level activities. Make sure students quote logically and support their facts. Ask students to write their answers to problems 1 and 2 from the worksheet The Great Depression. Allow them to share their answers aloud with partners afterward and continue to add checkmarks to the rubric as you listen to their partner interactions. Close the lesson by having students say a sentence using a fact from the worksheet The Great Depression. They may use any materials developed throughout the day's lesson. Tell students it's helpful to know how to correctly cite their answers because it can help them prove their responses are directly related to the text. Use this lesson plan to teach your students to evaluate texts for facts and opinions. Students will use a non-fiction text selection to collect quotes as proof. Then, back it up with hands on practise on and experience in their own levelled chapter books. They will enjoy building background knowledge for *Bud, Not Buddy* with great interactive and cooperative learning tasks. Read this text about the Great Depression with your students as they build comprehension skills.